The Computers Database (CHWEDES DB) is an integrated self-contained Microsoft Access 2007 relational database application. It facilitates storage and management of information about CHWEDES's, that is, Computer software and internal hardware configurations, HardWare External Devices, and External technical Services related to your information technology. It may, for instance, be used for storing information about Internet Service Providers (ISP's), Cable modems, Web Hosting services, Network configurations, routers, printers and scanners, MIDI devices, and other gadgets interfaced with your computer systems, as well as information about each of those computers. This is a copyrighted but open source project, and all source code and table and form properties are viewable and potentially revisable (with the exception of a required Access Library database). Because the details of how this database operates are visible, you might find educational some of the extensive VBA (Visual Basic for Applications) code and SQL queries that are included. It is my hope that this application could be useful to persons hoping to learn more about programming in Access, including using Windows API calls and various DAO and SQL programming techniques. I have attempted to ensure that the techniques employed are reasonably up-to-date and optimal, although there is surely always room for improvement. And of course a few undiscovered bugs are to be expected. Constructive feedback would be appreciated. Send comments to MCM at McGoodwin period NET (please convert this spam averse address to standard format when using). Your computer monitor or screen needs to have a resolution of at least 1280 x 1024 for the forms to properly display. Be certain you have Access 2007 or later installed. This database application uses features of Access 2007, such as Attachment files, and cannot be opened effectively in earlier versions of Access. Download ComputersDB.ZIP from this website here. Unpack the files contained in this ZIP file into a directory of your choice, preferably one reserved exclusively for this database. If the installation directory is not already "trusted", inform Access that the directory is to be a "Trusted Location". Do this in Access with Office Button > Access Options > Trust Center > Trust Center Settings > Trusted Locations > Add New Location, etc. You may choose to Trust subdirectories as well. You may of course defer setting the location to Trusted if you wish to inspect the VBA code the database employs before allowing macros and VBA code to run. Open ComputersP.accdb in Access 2007 or later. Add at least one computer by choosing "Add New CHWEDES" from the Main Menu. You may eventually add other computers, hardware external devices, and external services in the same way. 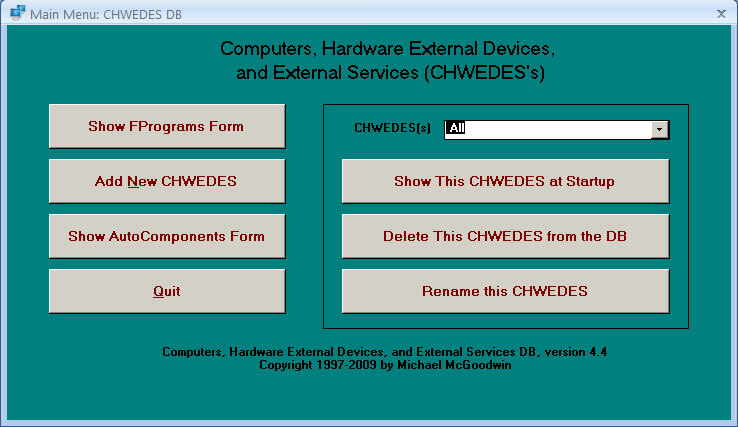 In the Main Menu, pressing the button "Show This CHWEDES at Startup" allows you to specify eventually which computer (CHWEDES) will be initially displayed when opening the FPrograms form. The Main Menu also allows one to view the FAutoComponents Form, and to delete a CHWEDES from the database, or rename a CHWEDES. Choose "Show FPrograms Form" from the Main Menu to view and update the data stored for the computer or other entities (CHWEDES's) that you add. Use the mouse to hover over and view Control Tips for explanations regarding each text box, button, or other control. The Status Bar also describes the purpose of each control when the control has been given the focus. When the Chronological Notes subform is invisible (due to the absence of any Chronological Notes for the current Item), you may click on the region reserved for this subform to display a new blank Chronological Note for the current Item that you may then fill in. There is no limit to the number of Chronological Notes that may be entered per Item. Each Chronological Note requires a date and optional time. If you wish to enter today's date and time, just click in the date/time field and then press "T". The icons employed on command buttons in form FPrograms and its subform are self-explanatory splashes of color. One clicks on FPrograms icons to add a new Item record, Clone an Item record, Save or Undo edits, or Delete an Item record. Clicking on subform icons allows one to see a larger view of a Chronological Note (by opening form FChronNotesExpanded), Save or Undo edits, or Delete a Chronological Note. You can click on the Combined Notes command button to open the FCombinedNotes form. This form displays all the Item Notes and Chronological Notes for the currently displayed Show CHWEDES(s) group in a single combined recordset, to facilitate searching. "C:\MyApps\Eudora\eudora.exe" redirects data location using initialization file "C:\EudoraData\EUDORA.INI". The FPrograms form includes a Search capability for searching for a character sequence within just the currently displayed Item. (In contrast, the Access Find and Replace dialog searches within all records in the currently displayed recordset, a behavior that can be undesirable.) The search field does not use wild cards (instead it interprets them literally), but you may enter the symbol ¶ for CR/LF, and you may include characters that can be difficult to search for, such as " ' ? | [ # - * ]. The FPrograms form also includes buttons to move back and forth using a navigation "stack" (for going back to or forward from records you have previously viewed). Feel free to try these out. The FAutoComponents form is of limited value, but it can be employed to store information about programs, services, and other things that startup automatically on your computer. It is opened from the Main Menu. 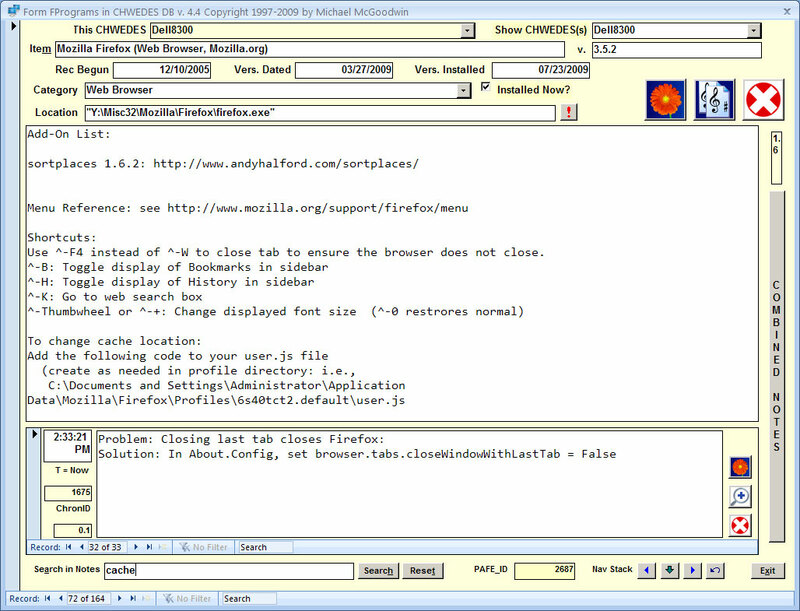 The FChronNotesExpanded and FCombinedNotes forms are opened from within the FPrograms form, and their functions are described above. There is no value in opening them from the Navigation Pane. Computersdb_manual.html. This manual webpage, always current on the Web. ComputersP.accdb. This is the application "Program" or "front-end" database file that drives the database with procedures and queries, etc. It contains no data, and can be replaced with more current versions without affecting your data (unless I choose to add tables or fields to tables later). ComputersD.accdb. This is the application "Data" or "back-end" database file. If and when you create new records in the database, this is the file that holds the data. If you update your installed copy of this file with a newer version downloaded in a subsequent install package, you will lose all the data you have entered. You are therefore advised to consider carefully before upgrading to later versions of this file. (I apologize that I will not be able to provide a simple solution for merging old and new data files.) You should probably place this file in the same directory as the Program file. However, if you choose to place it elsewhere, the application will ask you on first opening to point to where it is located. MCMLib.accde. This is a compiled Access 2007 Library file which I make use of in several database applications that I have developed besides this one. You may place this file in the same directory as ComputersP.accdb if you do not use other VG/MCM databases. If you choose to not locate this file in the same directory as the file ComputersP.accdb, it may prove necessary to "set a Reference" to this library. To do this, go to the VBA Editor using Alt-F11, invoke Tools > References, and if the reference to "MCMVGLib1" in "Available References" is marked "Missing", choose "Browse..." to find and select this file and be sure to click Ok after selecting it. Although you will not be able to view the actual VBA code contained in this library, the Object Browser in the VBA Editor gives you access to the list of the publicly usable procedures, constants, and enumerations contained in it (in case you are curious, or wish to use them for other purposes). I will eventually place more documentation about this Library on this website. Computers.ico. This icon file will appear automatically in the same directory as ComputersP.accdb and will be utilized on subsequent openings of the database. It is an example of a File Attachment data type, and is stored in the Data DB table Resources. Other Icon Files: These are incorporated into the Program DB forms, but are also stored as File Attachment data types in the table Resources. You may view links acknowledging the sources of these files in the Resources table. Representative view of the primary form FPrograms, showing the 72nd of 164 Items for the Dell8300 computer. The subform shows the 32nd of 33 Chronological Notes for this Item. Unable to make successful UNION query and form to combine all notes due to bugs in memo handling. Therefore created VB function to combine Notes for a given record. Revised method of creating combined notes, now makes temporary table and adds all records to it, then does query on this table. (Union query does not handle memo fields!) . Made more generalized by specifying computer names, computer IDs, and startup computer in the table ComputerNames. Tried to remove all user/computer specific code. Tweaked prompts when attempting to paste to a non-blank record. Will not paste same data a second time Revised Notes colors for Computer 4. Converted readme file readme_computersdb.txt to this HTML manual on this website. Massive revisions now for Access 2007, changed to a split database, consolidates all Chron Notes and Programs tables into single tables respecitvely, uses an Access Library, and many additional functional enhancements. Further tweaking of forms and VBA including union query.